In one of my last articles I showed you how to automate the backup process for Azure Disks attached to AKS. 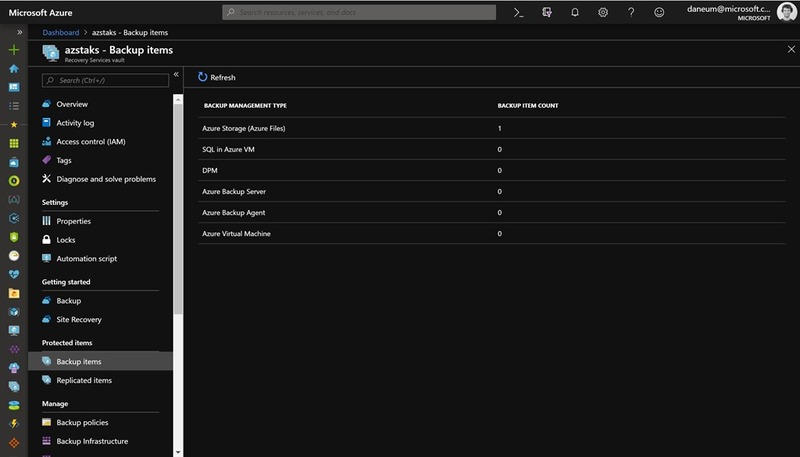 Today we look at the process for the second natively supported Azure storage option in Kubernetes on Azure, Azure Files. The good news is that we can use Azure Backup with its support for Azure Files. You will not have an easier backup process to set up. 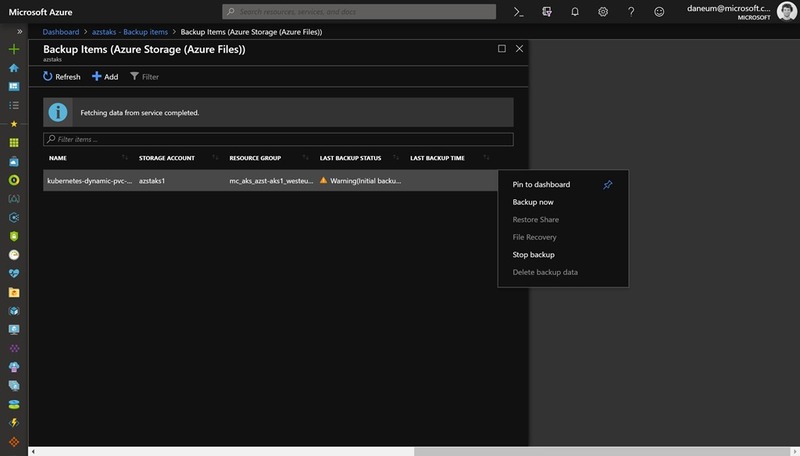 First, we need an Azure Recovery Services vault for storing the backup data and executing the backup process. Then we create an Azure Storage account to handle Azure file shares and storing the data. 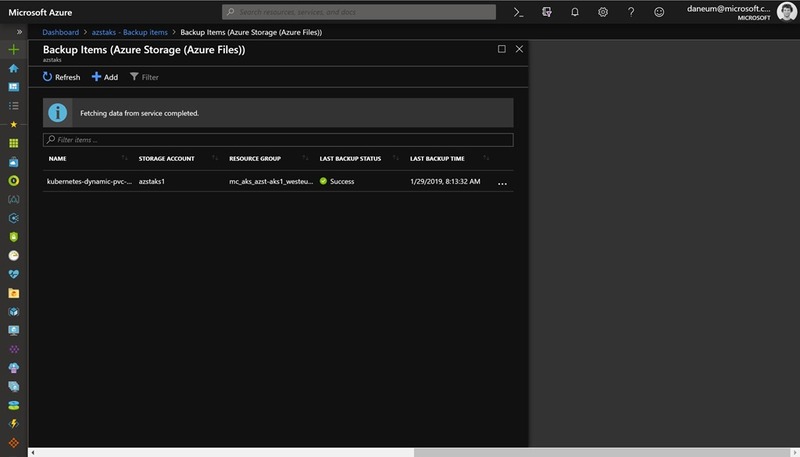 I created a 32 GB PVC for my SQL Server container and as you can see in the following screenshots the Azure file share got created and the SQL Server container placed the system databases onto the file share. Now, we can setup the backup process for the Azure file share to protect the SQL Server databases. In the overview section of the Azure Recovery Services vault klick on Backup. On the next blade select Azure FileShare (Preview) and hit the button Backup. Afterwards select the Azure Storage account and the Azure file share you want to backup. 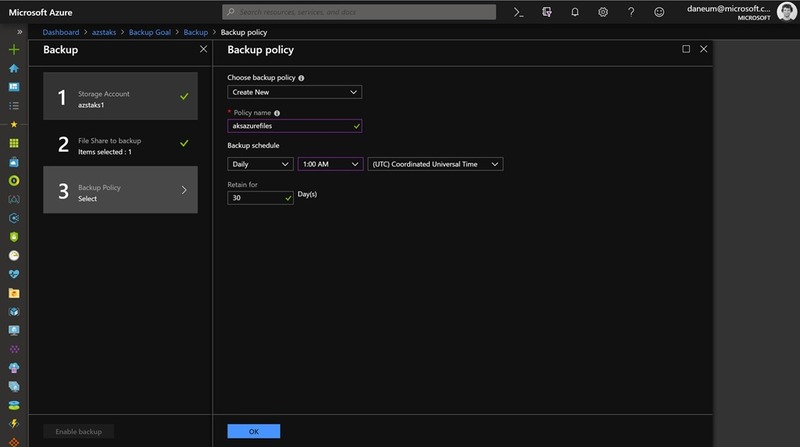 Finally, define the backup policy for the Azure file share and you are good to go. Depending on what you have specified previously as backup schedule the initial backup takes some time to be kicked off. But you can force it manually to have a recovery point ready directly afterwards you enabled the protection. Just hit Backup items in the overview pane and klick on Azure Storage (Azure Files). Make a right klick on the respective Azure file share and hit Backup now. Shortly after the first recovery point has been created and the data is protected by Azure Backup.